We work while you sleep! **We do not test for asbestos only by the naked eye. Concord Asbestos Abatement Inc. is your qualified asbestos specialist, working hard to identify, test, remove and remediate signs of asbestos in your building. 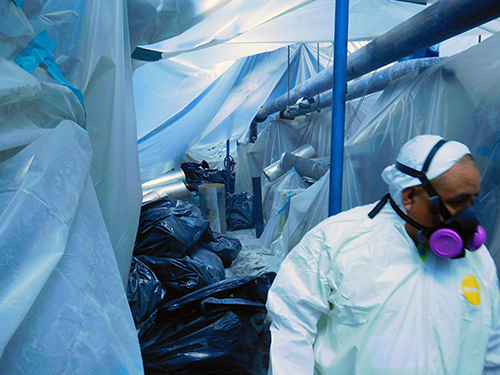 We leave every jobsite in a safe condition and handle asbestos removal with care. Best of all, we’ll help you keep your environment safe at an affordable cost! Schedule an inspection or removal today. We are proud to be certified in North and South Carolina, and are equipped to handle all asbestos situations with care and proper protocol. Our family-owned and locally-operated business has been serving the asbestos remediation and abatement needs of clients since 1986. Our associates are knowledgeable and do whatever they can to keep costs low. We’re dedicated to providing a job well done each and every time. Our asbestos remediation capabilities span projects of all sizes, from minor project cleanups to projects as large as entire commercial buildings. Our familiarity with asbestos and the many forms it can take allows us to be thorough and complete in the abatement services we deliver. Asbestos is a recognized carcinogen and health hazard. Unfortunately, just a few decades ago, it was also one of the most-used compounds in building materials—as part of insulation, cement, fiberboard and many more applications. Today, people are having these old materials removed to minimize the health effects of asbestos and Concord Asbestos Abatement Inc. is on the forefront of making sure the job is done right. We’re experts when it comes to asbestos removal in Concord, NC, working on projects of all sizes and scopes to completely and safely eliminate asbestos from your home or business. Our capabilities when it comes to asbestos are broad and encompassing. Not only can we inspect for and identify asbestos, we’re also equipped for asbestos testing in Concord, NC. Once we know what we’re dealing with, we’re able to get to work, properly removing all traces of the compound and thoroughly remediating your space so the threat is completely addressed. Our goal is to ensure the health of you and any occupants of your building—whether it’s your family or the employees who work for you. When it comes to asbestos, we work hard to give you peace of mind. Contact Concord Asbestos Abatement Inc. today to schedule an inspection, testing, sample pulling or removal services. We’re ready to help remediate the situation properly.